The first half was well contested by both sides, however, Brown seemed to be in a bit more control. Despite this apparent advantage, Brown squandered a number of offensive chances. On the positive side, every time Princeton made a surge, Brown knocked them back, shutting down their opportunities. Brown added another 3 points midway through the half thanks to the boot of wing Alex Ogilvy. The half concluded with the men from the north holding a less than comfortable 8-0 lead. Déjà vu all over again as Brown scored a try in under 2 minutes of the start of the second half. Brown fielded the opening kick moving the ball across the field and back. Prop Jordan Anderson and lock Streator Bates were alone near the sideline. Anderson took a pass, charged ahead then offloaded to Bates accelerating down the touchline at thundering speed. After outpacing and beating several Tigers, he was stopped short of the goal line. The surge of support from Streator’s teammates, including the support of the pass giver Anderson, drove Bates over the goal line for the score. Ogilvy added the conversion to cap off a fine start to the second act. With slightly over 20 minutes remaining in the half, the Bears were now settling into a rhythm. At the 65-minute mark, newly converted center (from back row) Jon Kim found his way through the defense for one of his two tries. His next would come about 10 minutes later with Ogilvy converting both. With 10 minutes remaining in the game, the wheels on the bus seemed to be falling off for the local side. 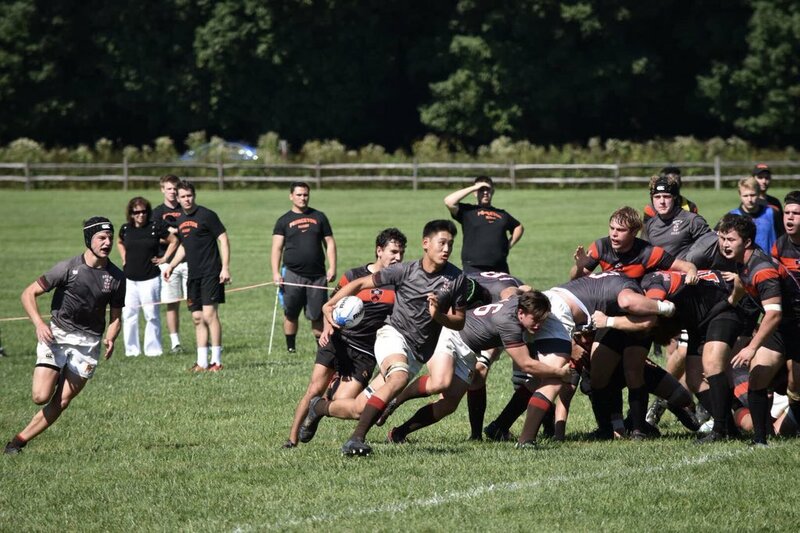 Brown caught Princeton napping and quickly move the ball within 10 meters of the Princeton line where Ogilvy scored and converted, making short work of the possession. Brown emptied its bench with time winding down. Newly subbed flanker Adam Eberle didn’t take long to get into the action. One minute into his time on the field, Eberle would find himself on the receiving end of 5 points as he gathered the ball off a ruck and drove over the line for the score and his first Brown Rugby try. With Ogilvy now watching from the sideline, it would be the subbed in fullback Oliver Bleacher to chalk up the last points on the day, slotting the conversion. With the exception of the first try of the match, Brown successfully converted a penalty and five consecutive tries. Brown’s 43-0 victory is the first hurdle of the 2018 campaign. Next week Brown travels to New Haven to take on Yale in what hopes to be an exciting matchup.